There are so many reason why the Pelicans shouldn’t have played Davis anymore. Not only did he publicly request for a trade, but his camp also dragged the team down in the days leading to the trade deadline. The Pelicans stood pat and decided to keep Davis until the offseason. But it’s clear that he’s not part of the franchise’s future anymore. Which is why it’s confusing why New Orleans fielded Davis in their game today. The Pelicans are supposed to be in rebuilding mode. Which means they should be racking up the losses to improve their draft position. Playing Davis won’t help that. They should focus on developing the young players they plan to keep on their roster and give the playing time to them instead (Hello, Kenrich Williams!). To make matters worse, there’s incredible risk in continuing to play Davis. His injury record isn’t exactly the cleanest one out there. In fact, Davis is returning from a finger injury that’s kept him out of the past nine games. 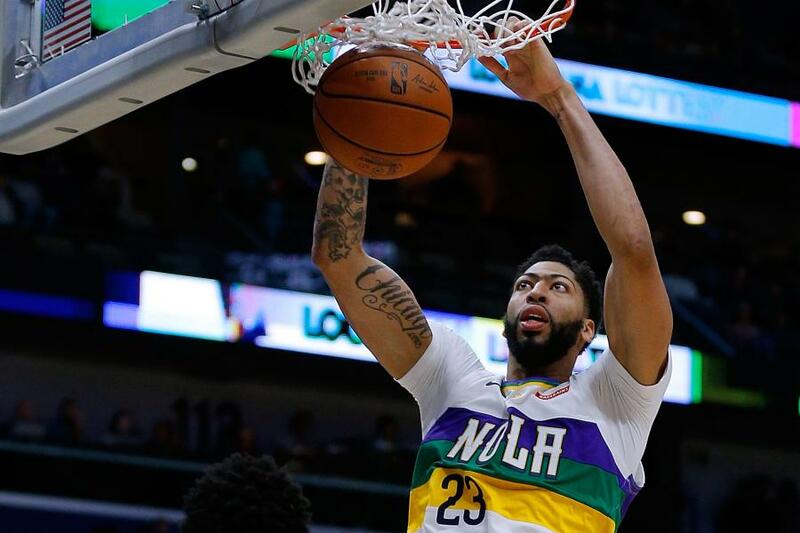 If Davis gets injured at any point from now until the offseason, the Pelicans lose any leverage they have and will probably have to trade Davis for cents on the dollar. Even with all that, the team still played Davis against the Timberwolves today. This was Davis’ first game back in New Orleans since his injury and since he asked to be traded. Naturally, the fans didn’t know how to treat this situation. Even though the Pelicans played Davis, they still managed to send him a statement in his first game back. Davis left the game with around three minutes left in the third quarter and the Pelicans holding on to a 12-point lead. He never checked back into the game. Even if Minny went on a run to get to within striking distance, Davis was planted on the bench. The rest of the team pulled together to get the win. Another statement, this time from his teammates. Of course, Davis being Davis was a beast. He finished with 32 points, nine rebounds and three blocks in just 25 minutes of playing time. He said all the right things after the game. He focused on the game, rather than all the trade drama. Alvin Gentry explained in the postgame presser that the fourth quarter benching was due to a minutes restriction. He spoke to Davis before the game and said that he was going to limit Davis’ minutes to just 22-25 instead of the usual 38-40. It’s not out of the realm of possibility for Davis to be under a minutes restriction. But what’s clear is that the team and the fans sent him a clear message today. it’s going to be awkward in New Orleans until the end of the season. The Sixers did put on a good show for their fans. They hosted one of the top teams in the West and gutted out a close win. Simmons came through with a dagger for the Sixers late in the game. With less than two minutes left and Philly holding on to a four-point lead, Simmons attacked the rack and jammed home the and-one dagger. That gave the Sixers the momentum to finish out the game. The Sixers got 97 points from their “Phantastic Five.” Simmons had 12, Joel Embiid had 15 and Jimmy Butler scored 22. The newest member of the team, Tobias Harris scored 14 points, eight rebounds and three assists in his debut. He also already moved up in a Philly ranking. The biggest scorer of the night was JJ Redick. The shooting guard torched the Nuggets for 34 points and six treys. The Sixers were impressive today. They look like a team that’s ready to make a deep, deep Playoff run. Hopefully, by that time, all their pieces gel. And also, hopefully, by that time, they get a better monicker. The Mavericks knocked down 22 three-pointers today. They also limited the Bucks to just 10 made three-pointers. But somehow, Dallas still lost to Milwaukee. That’s because the Bucks were still able to execute their vaunted offense. Even if they shot only 27% from the three-point line, Milwaukee still managed to finish with a 54% shooting clip. That means they shot a whopping 70% from the field. The Bucks shot only three shots from mid range. The rest of their shots came from beyond the arc and from in the paint. Take a look at how green that paint is. 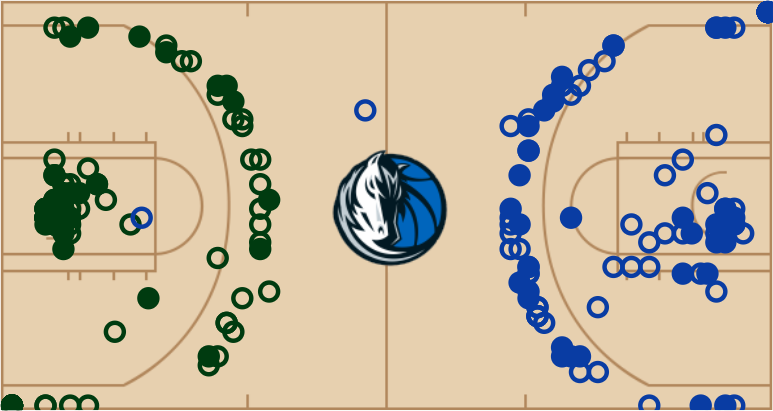 Taking away the midrange shots (1/3), the Bucks shot 72% from the paint. Even on an “off” shooting night, the Bucks can still dominate offensively. It’s also important to note that Milwaukee played without All-Star Khris Middleton today. They’re also about to get even scarier with the arrival of Nikola Mirotic. Good luck to the rest of the East.